The complexity of communications networks seems to increase inexorably with the deployment of new services, such as software-defined wide-area networking (SD-WAN), and new technology paradigms, such as network functions virtualization (NFV). To meet ever-rising customer expectations, communications service providers (CSPs) need to increase the intelligence of their network operations, planning and optimization. Heavy Reading believes that artificial intelligence (AI) and machine learning (ML) will be key to automating network operations and enhancing the customer experience. Although "big data" analytics is already widespread in the telecom industry, it is typically conducted in batch, after the fact, and used to manually update rules and policies. In order to move to real-time closed-loop automation, CSPs need systems that are capable of learning autonomously. That is only possible with AI/ML. Researchers in communication networks are tapping into AI/ML techniques to optimize network architecture, control and management, and to enable more autonomous operations. Meanwhile, practitioners are involved in initiatives such as the Telecom Infra Project's (TIP) Artificial Intelligence and Applied Machine Learning Group. AI/ML techniques are beginning to emerge in the networking domain to address the challenges of virtualization and cloud computing. Network automation platforms such as the Open Networking Automation Platform (ONAP) will need to incorporate AI techniques to deliver efficient, timely and reliable operations. However, we must not let ourselves get carried away by the breathless hype surrounding AI/ ML. Many so-called AI/ML systems today are mainly composed of "big data" tools, statistical analysis and a healthy dose of marketing. As our sister market intelligence firm Tractica surmises in its report Artificial Intelligence for Telecommunications Applications: "An immature ecosystem for telecom AI use cases has formed, made up of legacy telecom network and business support system (BSS)/operations support system (OSS) vendors; broad-based automated customer service specialists; CRM providers; open-source communities and organizations; established cybersecurity vendors; and a small but impressive number of startups." AI in Telecom Operations: Opportunities & Obstacles provides an overview of AI/ML, outlines the key telecom use cases, quantifies the level of adoption in CSPs today, and discusses the challenges of applying AI/ML to the networking domain. The report also provides real-world examples from 10 CSPs using AI/ML and summarizes key AI initiatives taking place in academia (Knowledge-Defined Networking), standards organizations (ETSI and IEEE), industry consortia (TIP) and open source projects (Acumos). The report profiles 16 vendors with AI-based offerings focused on the telecom industry. The use cases are typically in customer care, marketing and networking. Other use cases include IT operations, fraud and security. 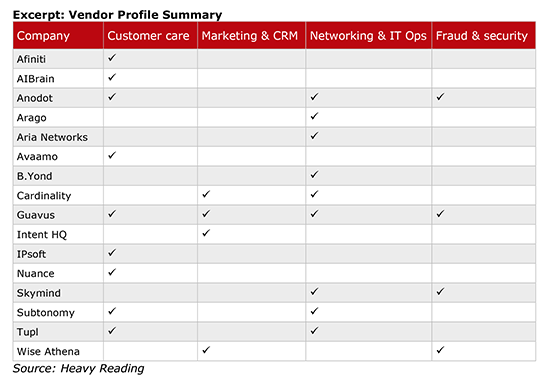 As shown in the excerpt below, of the 16 vendors profiled in this report, nine of them are applying AI to networking, nine to customer care, four to marketing/CRM, and four to fraud/security. AI in Telecom Operations: Opportunities & Obstacles is published in PDF format.